It's a banner year for hummingbirds in the garden. They visit multiple times a day and feast on all the tubular orange and red flowers they can find at Longview Ranch. Crocosmia 'Lucifer' is a favorite. 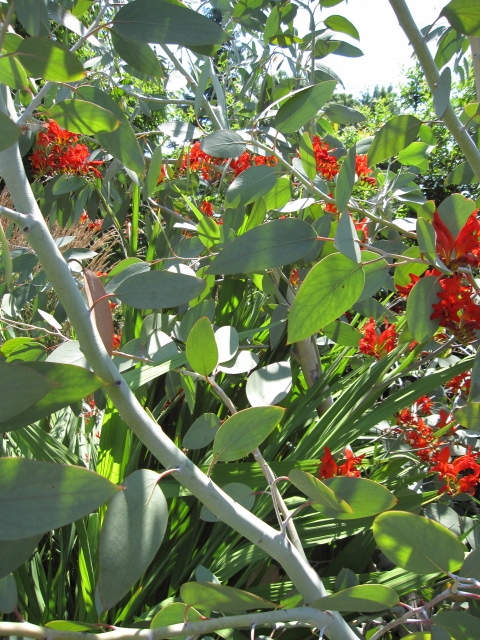 It's also one of my favorite flowers this time of year, as it mixes beautifully with the gray-green foliage of the Eucalyptus pauciflora ssp. debeuzevilli. The hummers are hard to capture with my point-and-shoot camera, but I keep trying. 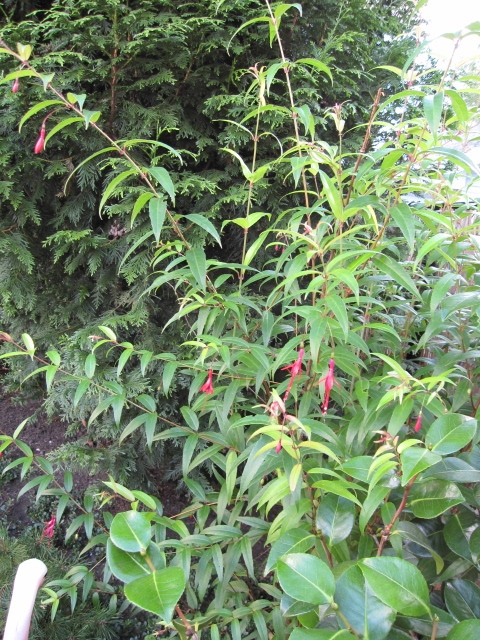 Other hummingbird magnets include the hardy Fuchsia hatchbachii. 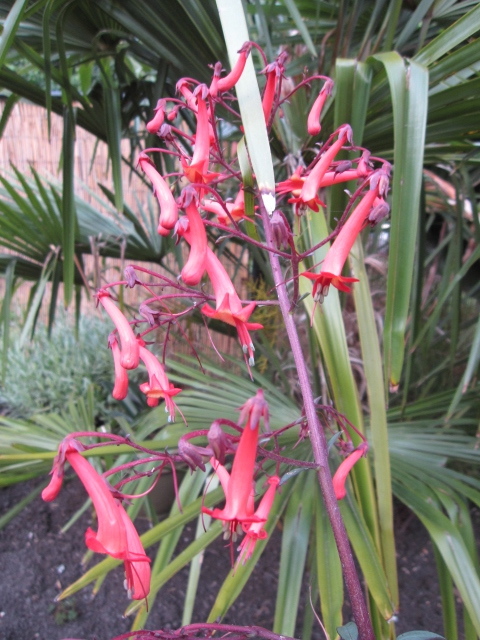 Phygelius x rectus 'Passionate' gets sampled regularly. 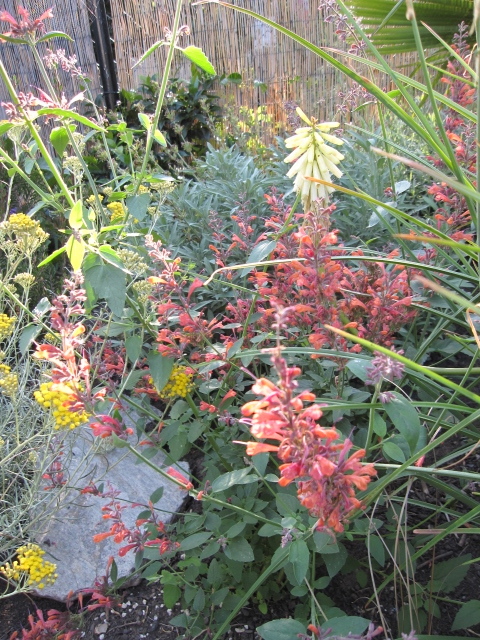 As does the Agastache 'Acapulco Orange'. 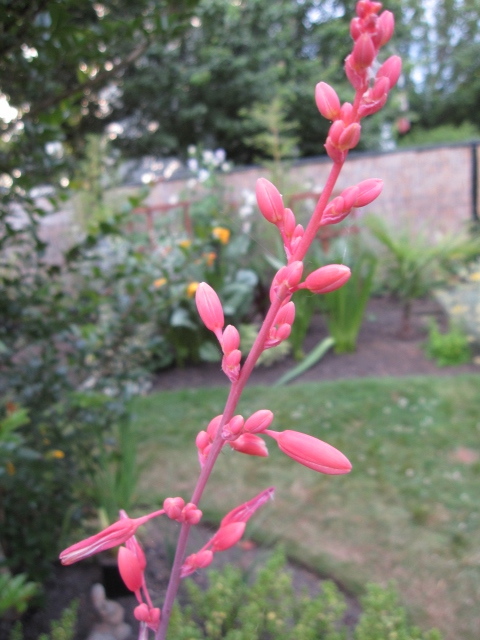 I have even seen the little hummers check out the Hesperaloe parviflora on the deck. They are not interested in some of my other exciting flower developments, however. 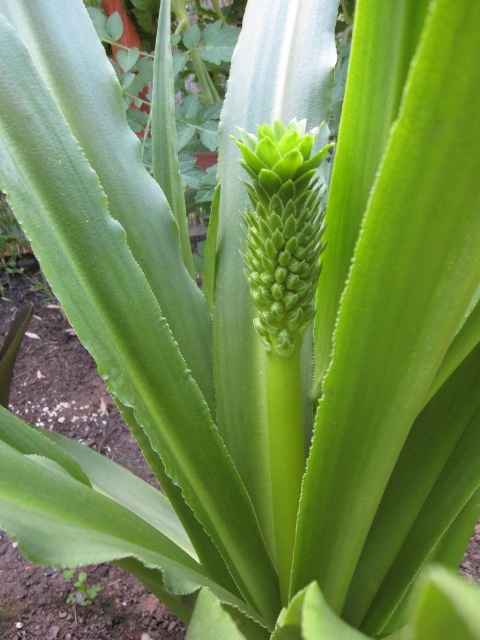 Not interested in my three Eucomis pole-evansii, one of which is finally going to flower this year. Also not interested, at least so far, in my Clivia minata 'Belgian Hybrid Orange', also just coming into bloom. I think those bright orange trumpets may attract them once they begin to open. The hummers may be uninterested, so far, but I'm pretty happy about these flowering developments in the gardens at Longview Ranch. It's been a busy month at Longview Ranch. We have six visiting mammals (two adults, two children and two dogs) through the end of August, and construction continues on the rebuilding of the patio cover. Consequently my posting time has been non-existent, though I've just been able to keep up with the garden. Luckily, the established plants aren't needing much of my care. See for yourself! 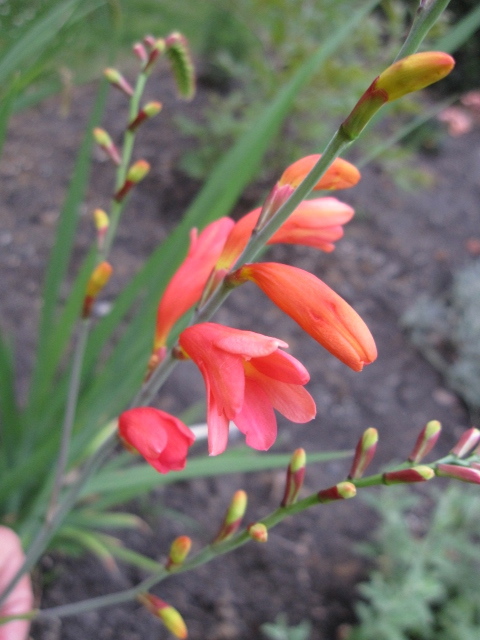 Crocosmia 'Lucifer' is attracting droves of hummingbirds this month. Potentilla fruticosa 'McKay's White' still holding out. Agastache ' Acapulco Orange' is getting more robust by the week. 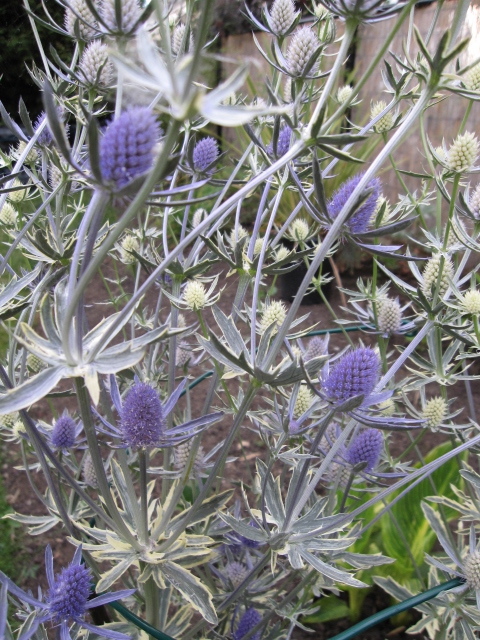 Eryngium planum 'Jade Frost's' blooms are maturing from silvery-white to a lovely blue. Phygelius x rectus 'Passionate'. I never paid much attention to Cape Fuchsias in the past, but this one with its dark red foliage and deep orange blooms caught my eye last year. Rosa 'Darlow's Enigma' is getting huge. 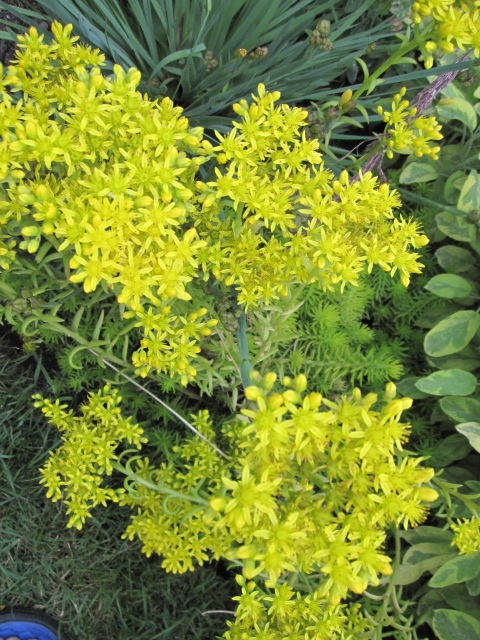 I'm loving Sedum 'Angelina's' bright yellow blooms over its acid green foliage. 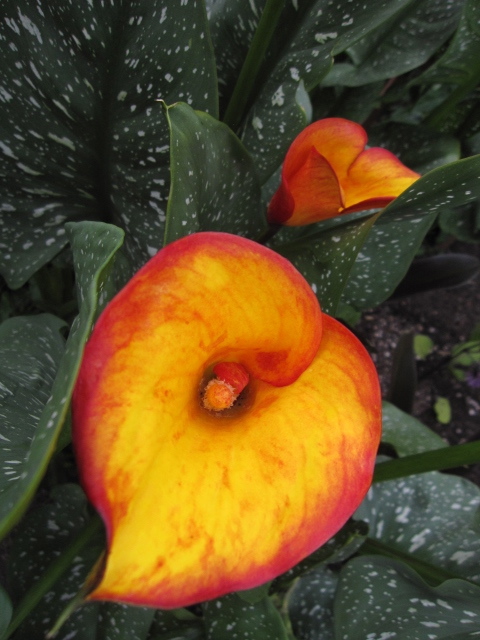 Zantedeschia 'Fiesta' from Joy Creek Nursery. 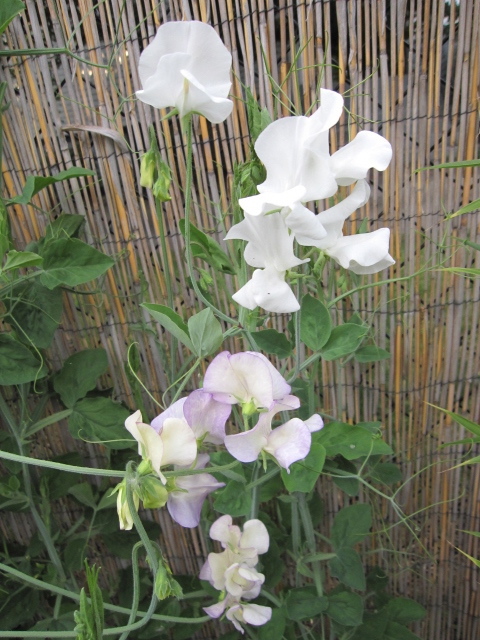 I was craving the scent of old-fashioned sweet peas (Lathyrus odoratus) earlier this year. The pastel pink, yellow and purple shown on the packaging were not my ideal choice, but the variety, 'Perfume Delight', was described as very fragrant. 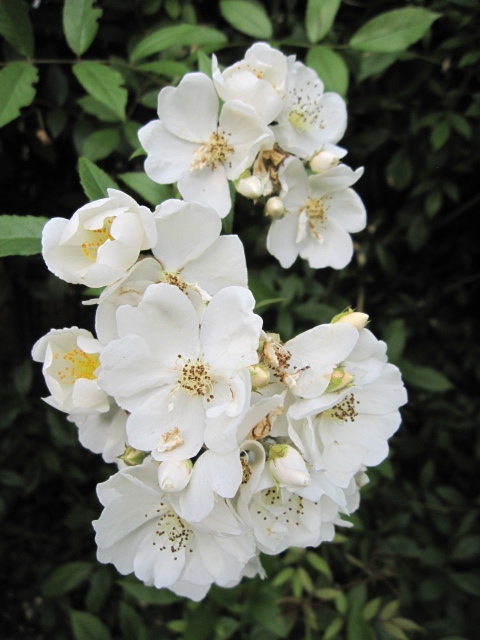 Every stem that has bloomed so far is pale violet fading to white, but they do smell wonderful. Tiny Snowberry flowers are attracting bees. Several Origanum rotundifolium 'Kent Beauty' are adding a touch of England to my brick planters. I don't know what possessed me to add a small orange Helianthemum 'Ben Nevis' to the the same planter - yuk! It's gotta go elsewhere, and quickly! 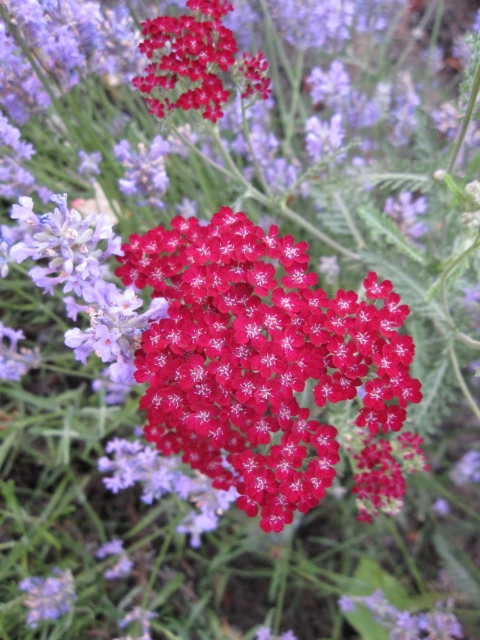 In another bad color moment, I realized Achillea 'Summerwine' is hanging out with a common lavender. At least one of them will be moving in the future. Crocosmia pottsii 'Culzean Pink' flowers are definitely on the bluer side of red. If they soften to a pinker shade, I'll enjoy them even more. 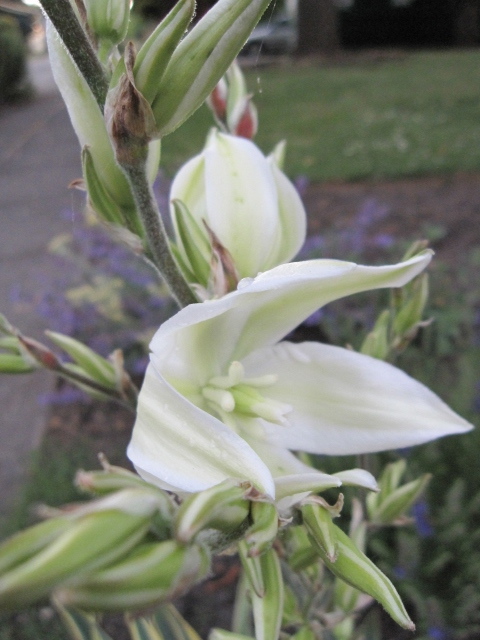 Yucca 'Bright Edge' is just beginning to open its rich white blooms. I love these summer bloomers that are appearing in starring roles all over town. Bloom Day is hosted by Carol at May Dreams Gardens. 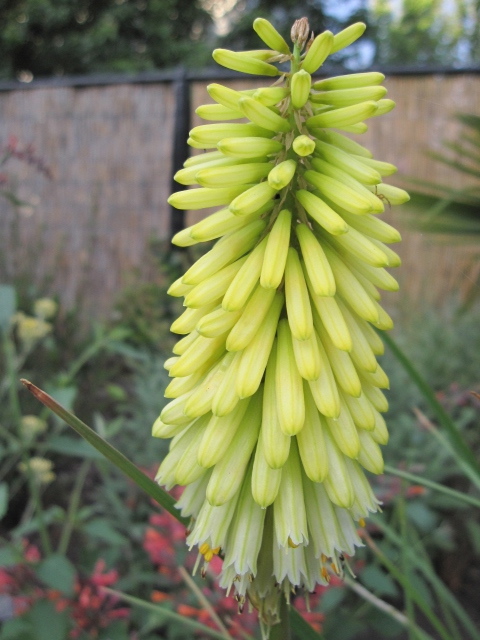 Click on over for a look at blooms everywhere this July!